Planning a beach vacation is something that most travelers do at least one time in their life. The thought of spending endless hours on a wide expansive stretch of sand is very inviting. Although not well known as a beach state, Texas offers incredible beaches. Here is a look at some of them. Probably one of the most popular beach destinations in the entire state, South Padre Island has gained fame in recent years as a destination familiar to college students during spring break. The island sits just off the mainland and in addition to having fun tourist attractions and first class resorts, it offers a decent amount of natural area too. There is always fun and excitement to have on South Padre Island. Matagorda Island State Park A great way to escape the standard vacation crowd is to take a trip to Matagorda Island State Park. The island is roughly seven miles off the coast of Texas and is inaccessible by car. The only way to get to the island is by private or charter boat, or by the walk-on ferry, that operates there during the day. The two most popular activities on the island are beach combing and fishing, with many world class fishing enthusiasts returning to the island year after year to try the waters. The area of Port Aranas and Mustang Island have been popular beach vacation destinations for locals and long distance travelers alike for almost a hundred years. Nearby Corpus Christi offers most of the urban attractions and features that travelers seek, but the Port Aranas area is all about the beach. 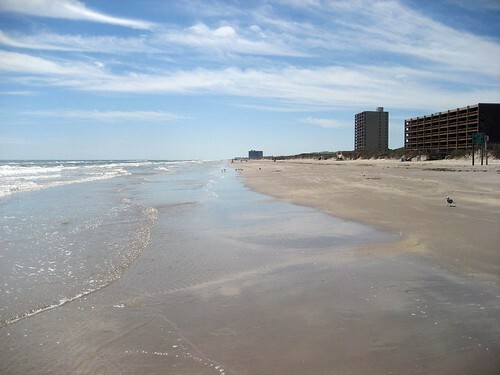 Miles and miles of quiet sandy beaches wait to be walked and explored at the traveler's leisure. The lack of crowds at Port Aranas is one of the biggest reasons frequenters to this great Texas beach continue to come back over and over. Padre Island National Seashore Located within a very easy drive across the local causeway from Corpus Christi, the Padre Island National Seashore is the perfect escape for anyone looking to leave the more developed parts of the world behind. This protected shoreline features miles of sandy beaches, abundant wildlife, and spectacular scenery. 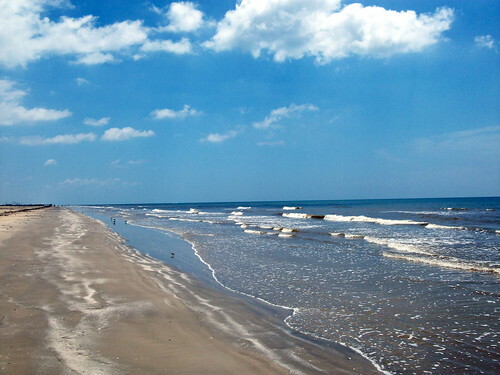 Padre Island National Seashore never disappoints any of the thousands of lucky visitors who frequently visit the area. Surfside Beach. Photo by mhcole. Located roughly an hour away from the exciting city of Houston, Surfside offers a great many things for anyone who comes its way. Those interested in exploring the beach will have more than enough area to walk without feeling overly crowded, those wanting to enjoy the sun or play in the sand will find an excellent opportunity to do so, and those that are interested in water recreation have definitely come to the right place. Surfside is known around the world as a great surfing area and there are a variety of other water recreational opportunities as well. Surfside is a fun place for anyone to visit. Galveston Island. Photo by stealth007s . From a historical perspective, few beaches can compete with all that Galveston Island has to offer. The island is easily one of the oldest vacation destinations in Texas and it continues to serve both those from the surrounding area and far away extremely well. There are all the opportunities for fun in the sun that most other beach locations offer, but the surrounding area also offers wonderful dining establishments, popular shopping opportunities, and first class hotels and resorts. 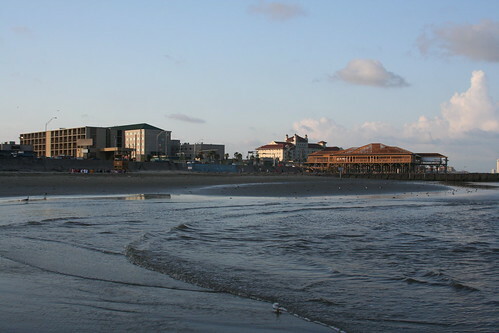 A visit to Galveston Island is a great way to make some wonderful Texas memories. Located just south of Port Arthur, Texas, Sea Rim State Park offers a somewhat unique beach experience to those that head its way. The beaches and water found at Sea Rim State Park are first class and a wonderful draw to the area, but one of the most fascinating areas of the park are the marshland in the area that are only accessible by boat. Exploring the marshland can make for a thrilling and unique experience. There are a number of wetland birds found there as well as other wildlife as well. This is the perfect Texas beach destination for the nature lover. Orbitz offers low prices for your next Texas vacation. Look for some orbitz promotion codes prior to booking online to ensure you get the best rates. Another option is using cheaptickets, orbitz sister site. Use a cheaptickets promo code for a discount. Visiting a beach during a vacation is tradition with many people and it often offers the chance to experience new and fun activities that cannot be experienced back home. The beaches of Texas are fabulous and plentiful and this is just a brief look at just some of what is available in the Lone Star State. From modern party locations to secluded natural areas, and everything in between, the state of Texas has a great deal to offer to anyone seeking a beach vacation. Choosing one of the many beaches in Texas is a great way to ensure that a vacation will be fun and entertaining for everyone included in the trip.